Another Monday is here! Is it just me or is the year – and this month in particular – flying! Phew I can barely keep up. It feels like this weekend was over while I just blinked. I hope you had a great weekend though! Hi there lovelies! I’m Thea for those who may not know. When Michelle asked me to guest post on her blog…Well let’s just say I spazzed out a little! There might have been some warrior chanting involved, some running like a crazy person around the house with my arms flailing, maybe a little bit of foaming at the mouth. It wasn’t pretty! But what can I say! I’m a fan! And I am lucky enough to have this lady as a friend also, so DOUBLE WIN!!! Anyway, when it came to the actual mani though I was stumped! I wanted it to be personal but I am not very good with translating peoples personalities through nail art. So I decided I’ll try and make something that Michelle might like (Thank you, Pinterest!). 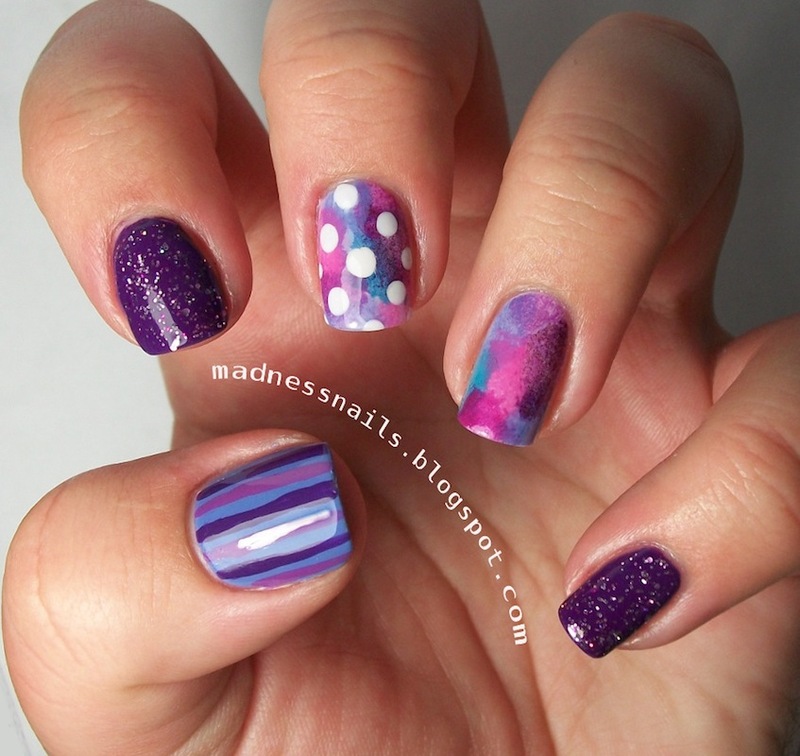 When in doubt, go for a skittlette mani! On my middle finger and ring finger I started out by laying down 2 coats of Tip Top Faerie Dust. When this was dry I went in with the small sponge pieces and sponged on Tip Top Nail Chic Grape To Meet You, China Glaze Flying High, China Glaze Secret Periwinkle, China Glaze Spontaneous and OPI If You Moust You Moust. When this was all dry, I sponged a bit of OPI Grape Set Match randomly on the nails just to give it a bit of coppery sparkle which unfortunately my camera refused to pick up! 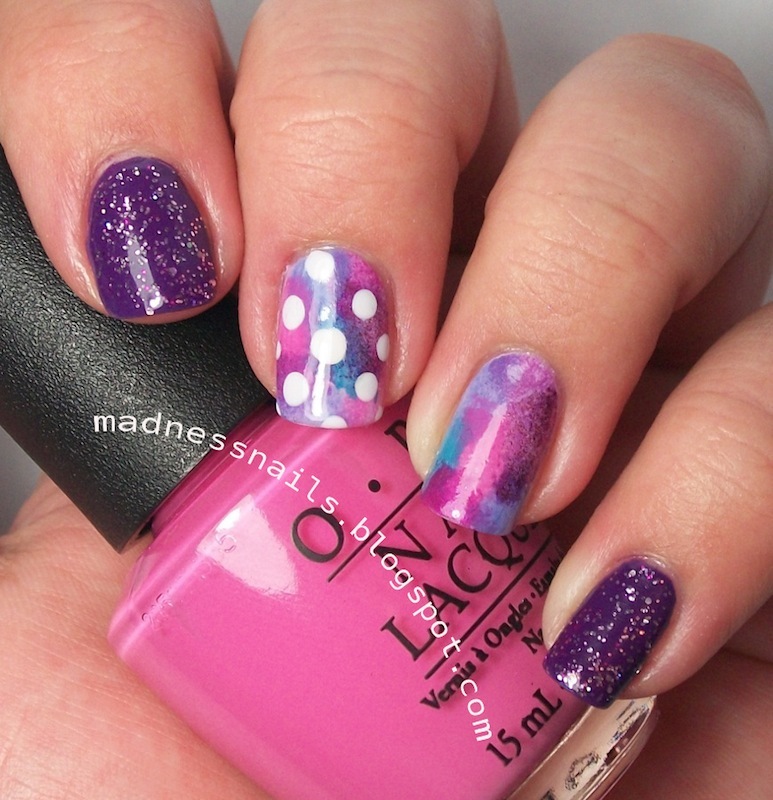 On my ring finger a placed a few polka dots with a big ended dotting tool and Sally Hansen Lavender Cloud. On my index finger I layed down 2 coats of China Glaze Grape Pop. Once this was dry I layed down 1 coat of Sinful Colors I miss You over it. Lastly on my thumb I layed down 2 coats of China Glaze Secret Periwinkle and freehanded the stripes on using my striping brush with China Glaze Spontaneous and China Glaze Grape Pop. In hindsight I see that I should’ve added a few pink stripes also just to round it off nicely. I did this mani because to me Michelle is a very happy and positive person and this mani just feels happy to me. Plus she likes polka dots and skittlette manis. I hope you guys enjoyed this mani! I loved, and felt very honored, to be a small part of Ordinary Misfits today! Thank you M, for this opportunity and your friendship! Both mean the world to me! Don’t you just love this? I adore this mani so much! I love the colour combinations and it just looks perfect! Thank you so much T. I love it!! Absolutely LOVE it!! Catch up with Thea on Madness Nails Blog, Facebook or twitter. Wow, her manicure is gorgeous! :-) Reminds me of the milky way. So pretty – espcially love the ring finger! Oh no this is SO kwaai!!!! I love the colours and I’m not a purple person at all but this is just kwaai! Love it muchly. Thea is also very talented!